Puerto Viejo, Costa Rica – 8:15PM MDT Oct 18 Last night we found another good restaurant, “The Jungle Love Cafe” and stuffed ourselves again. We traversed our way home through the Friday night crowds in the town center and spent another night relaxing – noticing a trend here? Today was the day we had scheduled to meet up at Barry and Nancy’s house. We met a 13-year old Bribri boy named Alejandro and his 10-year old brother Willie. Randy, Mel and Jeff went with the brothers on a jungle hike while Vicki stayed behind to help the Stevens prepare their weekly soup they provide for the Bribri families. Now, this was a JUNGLE hike. They took us the long route around “their jungle” to their “house” and then back again. We spent two hours sloshing through the mud, plants, trees, streams, ants, bugs, spiders and snakes. Alejandro speaks a little spanish and almost no english, Jeff speaks a little spanish and zero bribri. It was mostly a quiet hike with Alejandro pointing things out and saying them in spanish, getting an english confirmation from Jeff, and everybody shaking their heads in agreement. “pajaro,” “bird.” Everybody shakes heads, yep those are birds. “araña,” “spider.” Everybody shakes heads, yep, thats a spider, can we get away from it now? “tapa de la montaña,” “top of the mountain.” Everybody agrees we’re at the top. The hike was an amazing experience, not only for the chance to get really deep into the jungle where most people will never go, but also to see the way these families live. This is a 30 minute hike (taking the short route) from their house to the main road. No roads, power lines or water pipes go out there. We’ve got more thoughts and words to describe what this was like – too much to put here in this blog post. You’ll just have to wait to hear it from us! Here’s a video of us hiking through the jungle. 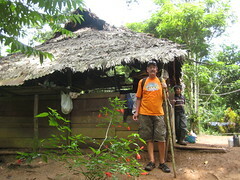 This entry was posted in Costa Rica 2008 and tagged costa rica, puerto viejo, Travel by The Gordons. Bookmark the permalink. It’s jungle “Curl” & the funky bunch!!!!!! Picture of Randy reminds me of the Philippines. Too bad there’s no surf. Have fun keepin it real.